Payload preparations for Arianespace’s next Ariane 5 flight are moving into their full pace with delivery of the mission’s other passenger, ISDLA-1, to French Guiana, where it joins the ARSAT-1 satellite that arrived earlier this month. Protected by its shipping container, ISDLA-1 is unloaded from the An-124 cargo jetliner following this high-power satellite’s arrival at Félix Eboué International Airport in French Guiana. 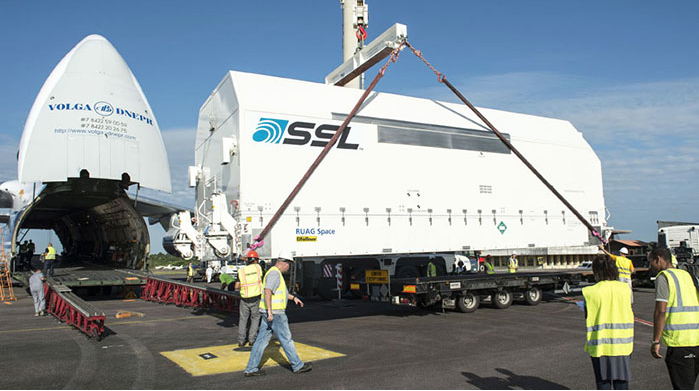 ISDLA-1 was transported this week by a chartered An-124 cargo jetliner which landed at Félix Eboué International Airport near the capital city of Cayenne, and subsequently was unloaded for transfer by road to the Spaceport. Systems/Loral) based on its proven 1300-series satellite platform. Together with the ISDLA-2 satellite that is to be lofted on a future flight, ISDLA-1 will greatly expand direct-to-home entertainment offerings in Latin America, as well as provide backup and restoration services—with each contracted to provide service for a minimum of 15 years. Both also will be co-located with Intelsat’s Galaxy 3C spacecraft at an orbital position of 95 degrees West. Scheduled for an October liftoff, Arianespace’s mission with ISDLA-1 and ARSAT-1 is designated Flight VA220 in the company’s launcher family numbering system. It will be the fifth launch of a heavy-lift Ariane 5 in 2014 – following the most recent success that orbited the MEASAT-3b and Optus 10 commercial telecommunications satellites from French Guiana on September 11. Follow Arianespace's launch activity at.